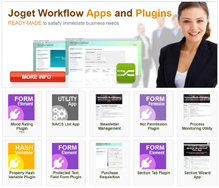 The Joget Workflow Enterprise Edition is intended for businesses requiring a production-ready, warranted product with additional features not found in the Community Edition. Fully supported by the Joget Team. Upgrade to Enterprise Edition now to receive enterprise-class support, software updates and exclusive features! If you cannot see the form below, please load it here.